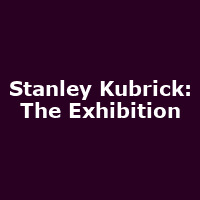 "Stanley Kubrick: The Exhibition will offer a unique insight into the director's vast archive through original props and costumes, set models and rare photographs, while tracing the design story behind Kubrick's body of work. His fascination with all aspects of design and architecture influenced every stage of all his films. He worked with many key designers of his generation, from Hardy Amies to Saul Bass, Eliot Noyes, Milena Canonero, and Ken Adam."